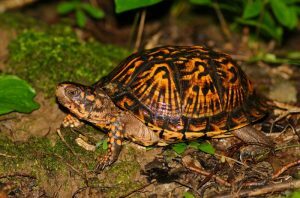 The ornate box turtle, alternatively known as the western box turtle, is a species of reptile with a slow growth rate. Consisting of two subspecies, they are found across a large area of the American Midwest, Southwest, and Northern Mexico. 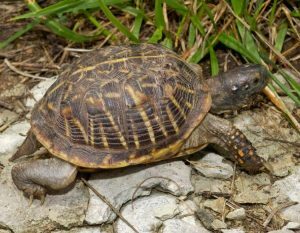 Size: Length of the carapace of the ornate box turtle is 4.72 inches, while the size of the plastron averages 4.72 and 4.52 inches in males and females respectively. Color: Carapace, head, limbs and the tail are dark brown to black in color. Thick yellow lines surround the scutes, while the shells have concentric rings that are used to ascertain their age. Adults have yellow spots on the heads. Sexual Dimorphism: Females are larger than males, while the latter are more colorful. The eye color also differs, being bright red for males and brown or black for females. Males also have large-sized, curved inner claws on the back feet, thick tail, and deep reddish legs. 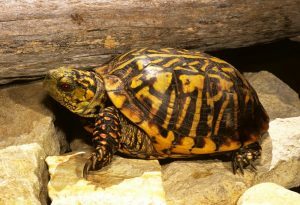 The ornate box turtle (Terrapene ornata ornata), the nominate subspecies, inhabits the area from Louisiana to Colorado and Gulf of Mexico up to Wisconsin. 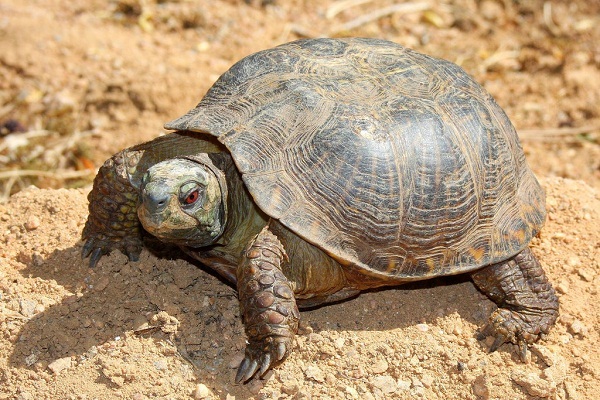 The desert box turtle (Terrapene ornata luteola) is the other subspecies, ranging from Sonora and Chihuahua in Mexico in the south to Arizona, New Mexico, and Texas. It has more yellow lines on its shell and body than the T. o. ornata. The nominate subspecies prefers grasslands at average heights of 4,920 ft (1,500 m). The desert box turtle can be found in more arid environments, specifically, semi-deserts and deserts with low humidity and soil temperature, while the air temperature should be high. This turtle species hibernates during the winter, returning to the same location for hibernation every year or at least a meter away from its dwelling place of the previous year. They prefer to stay within a particular radius for most of their lives and are solitary other than the mating season. 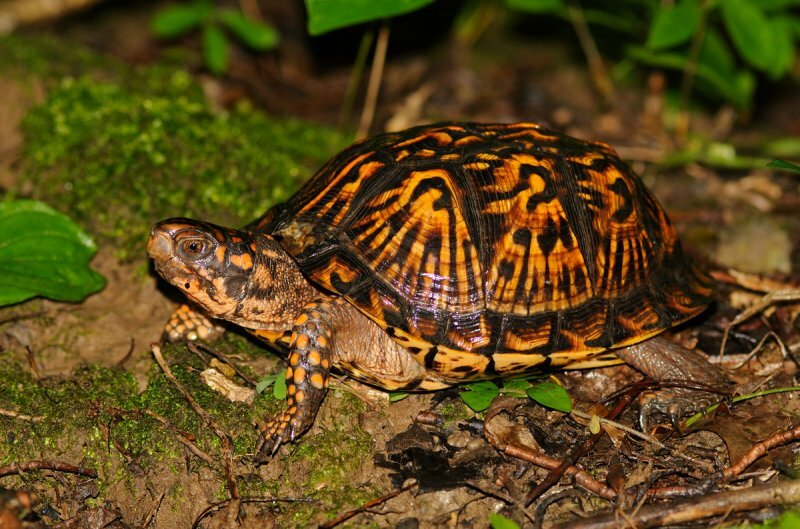 While most other turtle species are aquatic, the ornate box turtle is one of the few turtles to be terrestrial. They dig burrows into the ground at an angle of 30°-40° with the depth depending on the surrounding temperature, the colder it gets, the deeper the forms are. 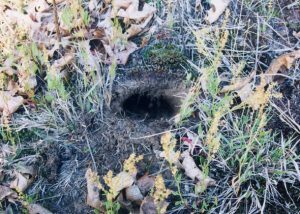 At times of high sunlight, they emerge from the burrows to raise their body temperature. Mating season for the ornate box turtle occurs between the months of April and July. Both sexes engage in polygynandry, with the females storing the sperm of males for long periods. A clutch or two are laid in a year. Several males often pursue one female, which leaves them to fight amongst each other until there is a winner, who gets to copulate with her. The gestation period is about 50 days, after which the female lays a clutch of up to eight eggs, once a day, either two hours after sunrise or before sunset. 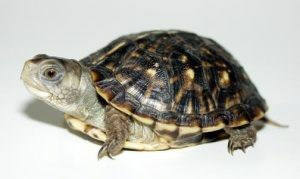 Parental care towards the baby ornate box turtles is virtually non-existent, leading to high hatchling mortality rates. The females reach sexual maturity after 8 years, while males attain gusto after just 5 years. They usually survive in the wild for between 30-37 years, with the oldest recorded individual being more than 40 years old. Data gathered on the communication methods of ornate box turtles are highly inadequate at this point. 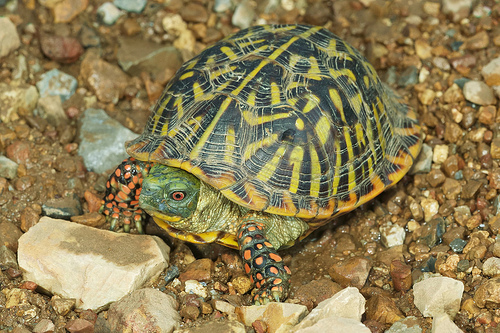 Ornate box turtles are omnivores. Their feeding preferences change according to availability. They may eat grasshoppers, beetles, earthworms, slugs, plants and fruits. Among the plants, they mostly prefer dandelions, mulberries, and prickly pears. They have even been seen feeding on carcasses, feces, and small fish. 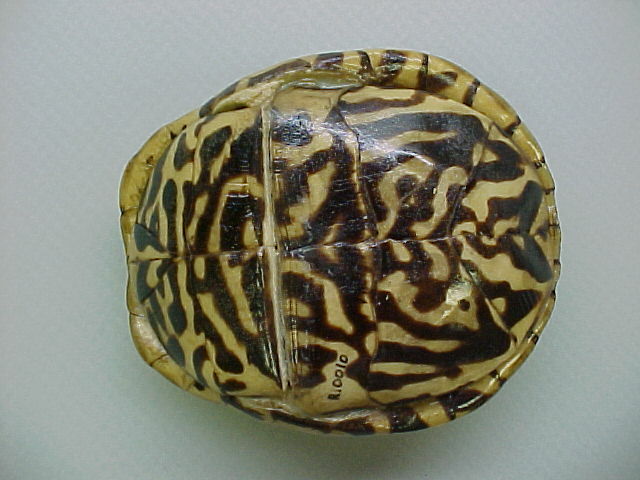 The hard shell covers the animal from injury and predators. Basking in the sunlight helps them to get rid of any parasites on their body. They have an acute sense of smell, helping them to tell one food from another and also to detect the nearby presence of predators. 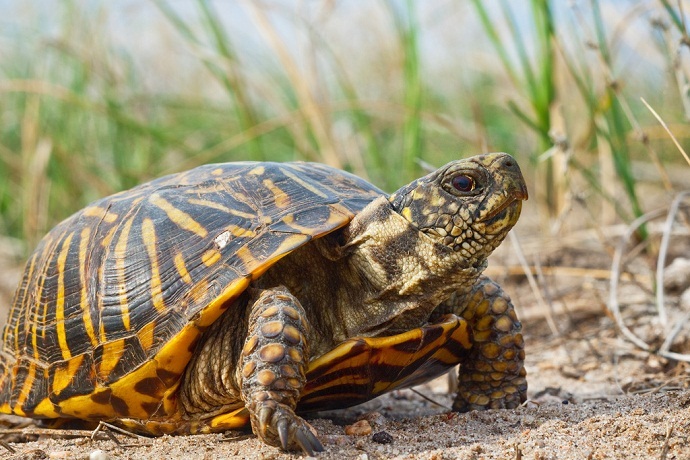 Coyotes, ravens, crows, skunks, copperhead snakes, inks, opossums, raccoons, red foxes, and dogs have been known to prey on the ornate box turtle, with babies and juvenile ornate box turtles being more vulnerable to attacks. 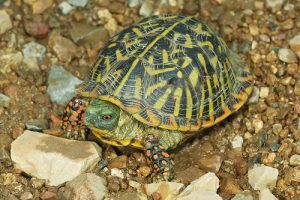 The IUCN Red List has categorized the ornate box turtle (both subspecies) as ‘Near Threatened’ as their population trend is on a decline. Ornate box turtles are a rather a popular choice as pets, probably since they are readily available. But in case you are hoping to keep one as a pet, certain things need to be kept in mind. Being delicate in nature it will need just the right amount of care to stay at optimum health. Provide it with an appropriately sized cage for its indoor habitat, though it would do best if you let it stay in its outdoor habitat for most of the day. Get all the necessary information from the vendor you buy it. If you see your turtle to have puffy or swollen eyes or discharge from the nose or eyes, take it to the veterinarian as soon as possible. 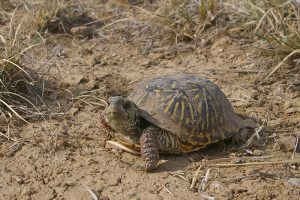 The ornate box turtle subspecies is the state reptile of the state of Kansas.